Chalabi, it turned out, was working for Tehran – which naturally wanted its old enemy, Saddam Hussein, put out of commission so the Shi’ite majority could take power. A decade later and the leaders of Shi’ite parties who had found shelter in Tehran for decades rule the roost in Baghdad – thanks to the very same people who are now exhorting us to attack Iran. Yes, the neoconservatives whose policies led directly to the extension of Iranian influence throughout Iraq now insist the Iranian mullahs are building "weapons of mass destruction" and must be stopped. Libya began falling apart the moment we announced its "liberation," and has gone rapidly downhill ever since. Yet the War Party achieved a nominal victory in that the scheme worked, after all. The Three Harpies of the Libyan Apocalypse – Hillary Clinton, Susan Rice, and Samantha Power – succeeded in dragging the President, not exactly kicking and screaming, into the Libyan mini-quagmire. If US troops weren’t bogged down fighting an insurgency, the administration soon found itself fending off a congressional insurgency around the attack on our "consulate" and the first assassination of an American ambassador in many years. So what or who pushed the President into the Syrian air strikes that never happened? I covered that in the run-up to the President’s announcement and his subsequent backing off in the face of popular outrage. Suffice to say here that once again the War Party had come up against what must inevitably be dubbed the "Iraq Syndrome," after its predecessor, the "Vietnam Syndrome." Of course the real disease vector is in Washington, where the contagion of empire has unleashed an authoritarian plague eating away at the Constitution and the rule of law. A lawless regime of total surveillance has usurped the Fourth Amendment, and the bulwark of liberty, the Bill of Rights, is besieged in the name of "national security." The first Clinton administration, you’ll recall, was focused on the anti-Slavic front, spending most of its foreign policy capital fighting a civilizational war against the Slavic Orthodox Russophiles of Serbia and Bosnia on behalf of the oppressed Muslim minority in the former Yugoslavia. This war will be resumed if and when the Clintons retake the White House; indeed, we are seeing the first stages of it unfold quite dramatically in the streets of Kiev. Not to worry. Thanks to the infusion of untold millions into various NGOs and Ukrainian opposition groups, there are new "heroes of the Revolution" who have taken the stage in the Maiden – and taken power in Western Ukraine. No need to send in US troops: the muscle is provided by the black-masked cadre of "Right Sector," football hooligans and neo-Nazi skinheads who wear the red-and-black insignia of the pro-Nazi Ukrainians who fought under SS command during World War II. 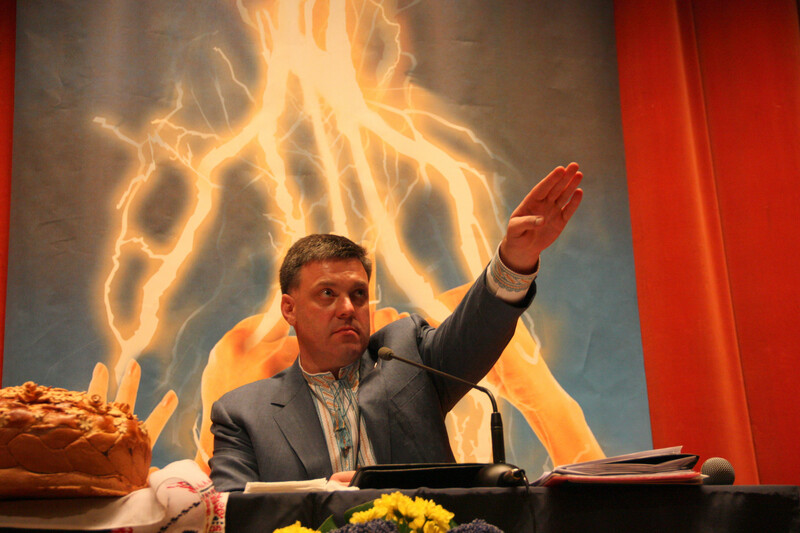 Their fuehrer leader, Dmytro Yorash, is deputy chief of "national security," i.e. the new regime’s political police. With banker-technocrats like Arsenyi Yatsenyuk as inoffensive front man, the real coup leaders in Kiev – a coalition of old-time oligarchs like Julia Tymoshenko and the "reformed’ neo-Nazis of the ultra-nationalist Svoboda party – are setting the stage for a proxy war against the Russians. We have already seen a series of low-level provocations, on the border and elsewhere, and now that the referendum over Crimea has taken place a military clash is all too possible. As in the case of the Syrian rebels, we’ll be providing aid to Ukraine – a cool $1 billion to start with – while our media shamelessly roots for the embattled "freedom-fighters." Yet there is a growing awareness – see here, here, and here – in "mainstream" quarters of the "interim" Ukrainian government’s creepiness. There really is no other word I can think of that describes a party which valorizes Stepan Bandera and the other founders of the Ukrainian SS unit that murdered 4,000 Jews in Lvov, and actively participated in the Holocaust. The Svoboda party, whose leader has denounced an alleged "Muscovite-Jewish" conspiracy against Ukraine, has no less than eight top posts in the coupist "government" in Kiev, that is if you count the even more radical Yorash as a fellow traveler. Indeed, President Clinton set up a special office of Caspian Basin Energy Diplomacy and appointed Richard Morningstar as his Special Advisor and overseer of the new sub-agency. If the US could yank the ex-Soviet states in the region out of Russia’s "near abroad," Western companies could reap mega-profits while the Russians were locked out – and Putin’s energy chokehold on Europe would be broken. The project was a classic case of crony capitalism and cynical geopolitics, with the US government canoodling with foreign dictators – some of them quite bizarre – in order to set up American and allied companies for the alleged coming "gold rush" in Caspian energy production.